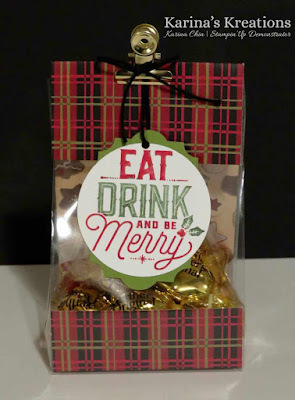 Karina's Kreations: Merry Little Labels Treat Bag! Merry Little Labels Treat Bag! Do you get my newsletters? I just emailed out the instructions for this cute little bag. The bag uses the 3" x 6" Gusseted cello Bags from Stampin'Up. They cute and quick to make and would be perfect for gift cards or treats for friends over the holiday season.